In July 1882, Don José Gurulé, a descendant of early Placitas settlers, took his ox team to Bernalillo to haul freight. There he met José Yné s Perea, the first Presbyterian Spanish minister ordained by the Santa Fe Presbytery in New Mexico. Rev. 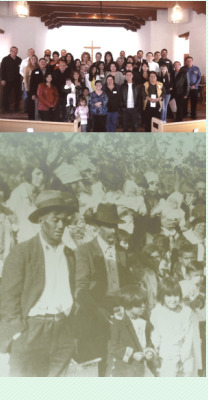 Perea accepted Gurulé's invitation to hold services in Placitas, then left the work to be continued by John Menaul. He organized an 80 member church which eventually dissolved. The church was officially established February 24, 1894. After compelling sermons by J.Y. Perea and James Menaul, 95 people voted to found Las Placitas Presbyterian Church with 39 charter members. Menaul immediately ordained newly elected elders Francisco Trujillo and Juan Baros, and Perea administered the Lord's Supper. The new congregation met in the Mission School until 1930, when a new building was finished, which we now know as the Upper Room. In 1984 the current Sanctuary and most of the Fellowship Hall were added. The newest addition, including the Educational Wing was dedicated on May 15, 2005. Placitas is located 20 miles northeast of Albuquerque at an altitude of 6,000 feet. The village sits at the base of the Sandia mountains and has many vineyards, gardens and small orchards which are watered from mountain springs through acequias madres (mother ditches) built long ago. It is suspected that the village is built on Anasazi ruins. In honor of our congregation's Spanish heritage, we include Spanish in every service, including Spanish hymns, Spanish scripture, and often the Lord's prayer and Communion. An English translation of the scripture being read in Spanish is printed in the bulletin.